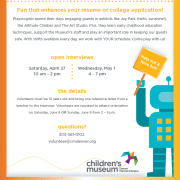 Visit the Museum and learn about all the amazing ways to volunteer! This is a great chance to see what we are all about, tour the Museum, meet ongoing volunteers, and interview with our volunteer team. From Guest Service and Teaching Kitchen Assistants to Art Studio Ambassadors and Playologists - there's something for everyone! RSVP is requested for this event, so make sure to contact us before April 27th! While hours are flexible, we ask that volunteers interested in an on-going position commit to a minimum of three months of service. Please note: We accept volunteers 9 years of age and older; ages 9 - 13 must have a guardian with them when they volunteer. Volunteers over the age of 18 must complete a background check.